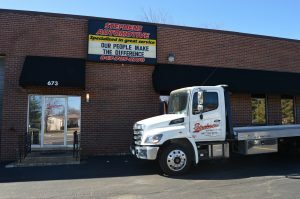 Stephens Automotive offers a full-service facility for auto repair, truck and fleet maintenance. If you’re looking for fleet repair or truck fleet maintenance on 3 vehicles to 300 our team is ready to provide comprehensive fleet maintenance services with a rapid turnaround. At Stephens Automotive we understand you don’t have time for vehicle breakdown when you are running a business which is why we offer the best in fleet vehicle maintenance near Palatine. We assure you that your fleet maintenance and fleet repair will be done right the first time. Stephens Automotive has five ASE Certified Technicians, thousands of satisfied customers and over 100 years of combined experience among our team. Palatine is a lively village and suburb on the northwest side of Chicago Illinois and has a population of 68,557. Palatine was home to the Cook County Fair from 1914 to 1931 which today has been turned into a subdivision. We know things change with time which is why we want you to allow us to save you time and money by scheduling your truck fleet maintenance. Stephens Automotive guarantees that your fleet vehicle maintenance is done right. Stephens Automotive takes your fleet maintenance and fleet repair serious. We have one of the largest auto repair centers in Palatine. We give you timely truck fleet maintenance and your concerns regarding fleet maintenance services will be addressed promptly. Stephens Automotive is proud to offer fleet vehicle maintenance services for all makes and models. Contact our fleet service consultant at (847) 705-8770 and allow us to exceed your expectations. We use the latest in state-of-the-art diagnostic and repair equipment to ensure quality fleet maintenance.